The Angriest: Star Trek: Voyager: "Alliances"
It is 22 January 1996, and time for another episode of Star Trek: Voyager. After Voyager is almost destroyed in the latest of a series of Kazon attacks, Chakotay (Robert Beltran) persuades Janeway (Kate Mulgrew) to seek an alliance with one of the rival Kazon houses to protect the ship from the others. It is a proposition that Janeway despises - it is everything her Federation values stand against - but simply to ensure the survival of her crew, she is forced to compromise. "Alliances" is a mostly great episode of Voyager, one only let down by an inevitably gun-shy conclusion. Until that point it is probably the best Season 2 episode so far, and a rare episode that actually makes use of the series' basic premise: Starfleet and Maquis crews having to join together and work as a single unit. This is, in essence, the sort of episode for which Voyager seemed designed to accommodate. Once again we have an episode that kicks off in-media-res, with the Voyager already almost destroyed by a Kazon attack. It's a great opening, and immediately sells the level of crisis to which the crew has reached. They are being hounded across space by rival Kazon tribes, and put simply they don't have anything left with which to defend themselves. Tensions are high. At a funeral for a dead crewmate, a junior Maquis officer directly challenges Captain Janeway to simply capitulate to Kazon demands and give them Starfleet technology. She fiercely insists she'll let the whole ship burn and its crew die before she does such a thing. It's a spectacularly low-morale moment, but pushes Janeway neatly to a point where she actually agrees with Chakotay's suggestion: find one Kazon tribe, ally with them, defend them if they need it, and use the alliance to make the other tribes back off and leave Voyager alone. 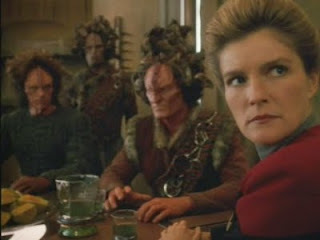 While Janeway and Chakotay have a disastrous experience trying to ally with former enemies Cullah (Anthony de Longis) and Seska (Martha Hackett), Neelix has more luck meeting the Trabe - another alien civilization of the region whose former cruelty and slavery created the Kazon tribes in the first place. It is a neat piece of world-building, one that fleshes out the Kazon more than all previous episodes combined. When the Trabe representative leads Janeway to propose an overall peace between all parties, it feels like a typical Star Trek solution. That the episode then snatches that opportunity away is a delight. The series has never previously headed into such morally ambiguous territory. That new territory is also represented by the opening of a new story arc that will continue over the coming episodes. Michael Jonas (Raphael Sbarge), a Voyager officer sick of Janeway's refusals to compromise over Starfleet protocols, begins offering intelligence to Cullah and Seska on the side. It is a nicely motivated new thread. Of course in the end it all falls in a heap with a failure to make peace and a tonally deaf and sanctimonious speech by Janeway. Compromise and taking opportunities did not work in this case, so clearly - at least in Janeway's mind - such strategies will never work. The greying of Voyager's morality begins and ends here. It's a disappointment, but thankfully not so much that the entire episode is ruined. It's still pretty great. We're 14 episodes in Season 2, and eight episodes have been good. The quality ratio rises to 57 per cent.